It’s been apparent among B2B sales teams for years now that their jobs have changed. Hundreds of interviews with senior sales managers across different industries and parts of the world showed that this huge slew of demands on sales reps divide into three main categories. More information: As we have covered in depth, customers are armed with more high quality information and, sometimes, third-party purchasing consultants and strategic sourcing processes. All this means customers think they know everything they need to in order to make a well-informed purchase. It also means that they think they have made up their mind before they first meet a sales rep, and can leave reps having nothing to negotiate on except price. More people: As businesses become more globally dispersed, and their operations more complex, the solutions on offer from suppliers have had to become more complex to match. On top of a more complex offer, there are far more decision-makers that must sign off on any deal, and these decision-makers often hail from diverse regions (and cultures), functions, and business lines. This means that, at best, they have different perspectives and, at worst, competing goals (a business-unit risk manager and a line manager for example). More options: An increase in the technological capabilities available to all suppliers, increases the number of possible competitors and the potential for disruptive alternatives. This – and the profusion of information about all these options (see point 1) – creates an expectation that a solution exists to perfectly solve the customer’s specific problem. 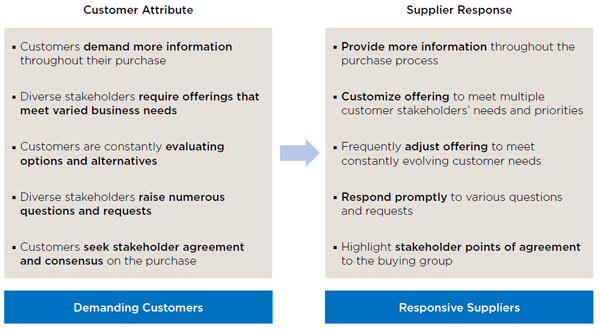 As customers demand additional capabilities, more price and margin concessions, and further support from sales and implementation teams, sellers are left with no better option but to provide more support throughout the sales process, flexing to customer needs, and differentiating themselves from competitors by responding to customers promptly (see chart 1). 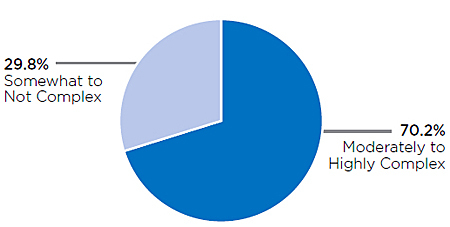 With all the new burdens these changes in buying behavior are placing on sellers, it should come as no surprise that on a CEB survey of over 1,000 B2B sellers, nearly three quarters of surveyed reps reported that their jobs are highly complex (see chart 2).